Time to raid the attic, the fascinator is back. Or did it every really go away? 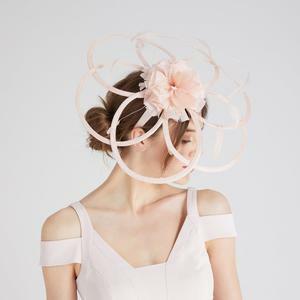 Wedding guests have been donning the whimsical headpiece for decades, but it was at the 2011 royal wedding of Britain's Prince William and Kate Middleton that the modern fascinator really caught people's attention. However with all the pomp and ceremony surrounding more recent British royal nuptials, the fascinator is slowing clawing its way back into peoples' considerations. Just this weekend, newlywed Meghan Markle turned heads in a china-print blue and white dress that cause yet another style stir (Was it too big? Maybe. Was she lost in it? Perhaps. Did it look like she could finally be comfortable having a three course meal and a dance afterwards? Certainly!) and when it was revealed that her headwear cost a cool €35, more opinionistas sat up to attention. But while some compared the white pillbox bow hairpiece to a mesh shower pouf, others were happy to see the Duchess of Sussex giving the high street a whirl and having a bit of fun with fashion (she also gave her whtet wedding shoes another outing, only to get them stuck in the mud). They're not for everyone, granted, but there's just something about a fascinator that elevates a chic formal frock to nuptial status. A good crown atop a formal gúna can even make one feel more regally inclined. More importantly, fascinators are just a bit of fun. After all, in the words of Kate Spade, "playing dress up begins at five and never really ends". Rachel Farrell Shopping for everyday clothes as a mum-to-be can be difficult enough, let alone occasion wear. #Haveyoursay - How much does it cost to be a bridesmaid for an Irish wedding?